I only have one picture of this dinner, but I think it’s all you need. 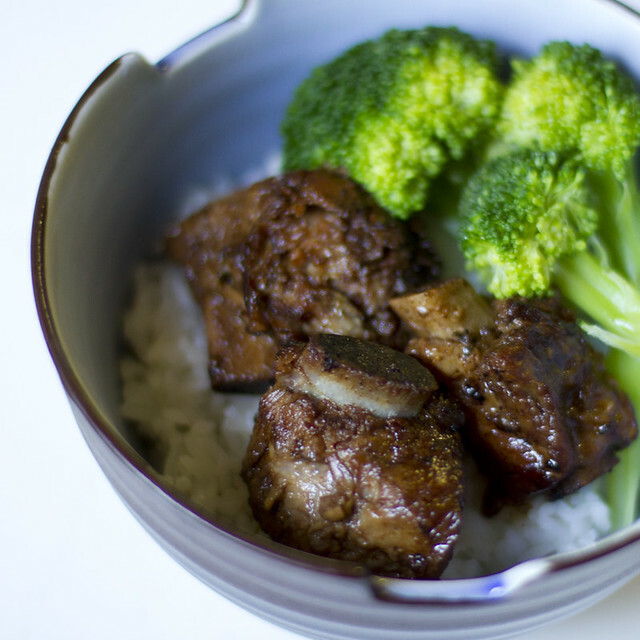 My mom’s Chinese short ribs are a family favorite: she makes a giant batch whenever there’s a crowd to feed, and even when it’s just our nuclear family. She simmers them on the stovetop, but I thought they might be a good candidate for the slow cooker. A steaming bowlful is perfect on a chilly day, and the weather has JUST turned cool here in New York City. When I saw that Fresh Direct now sells short ribs cut into thirds, the way my mom says is best for this dish, I immediately bought some and called mom in Norway to ask her how to make them. Of course, it was vague in the way that mom recipes are, but I tried to quantify it a bit. It’s so dead easy, you’re going to laugh. Cut the ribs apart between the bones so you have lots of smallish ribs. Heat the oil in a pot, dutch oven, or the base of your slow cooker if it can be used on the stovetop. Sprinkle the ribs with salt and pepper, and sear on all sides until browned, working in batches so that you don’t crowd the pan, until they’re brown on all sides. They won’t be cooked through. Transfer to a bowl or to the base of the slow cooker. In the end, put them all in the slow cooker base. When all the ribs are browned, deglaze the pan with the black bean sauce and water. Let sizzle just a bit. Pour the sauce over the ribs in the slow cooker and set on low. Cook for 9-11 hours, stirring occasionally so they all get submerged at some point. Meanwhile, steam white rice. I like this with steamed broccoli, but bok choy or another green veggie would be fine. Serve a bowlful of rice with the ribs and vegetable. I show just three ribs in the photo, but that is a farce: pile them on! You can discard the bones as you’re serving, as they fall out very easily, or leave them in. Garnish with scallion if desired. Yum! You’ve taken my recipe a step further and put in the slow cooker. Those look awesome! And easy. I like awesome and easy. I am pinning this right now. Oh! These look mouth-wateringly fabulous! Thanks for sharing. Looks yummy! Thanks for sharing the recipe.